A union of grandiose Austrian Black Metal! The Negative Bias channels a transcendental nightmare from the deepest dark space revealing astral atmospheric black metal of a higher order. This is symphonic Black Metal in all of its sinister majesty without sounding too nostalgic but aspiring to create a modernist bleak vision with complex songwriting and brooding, gritty disdain. 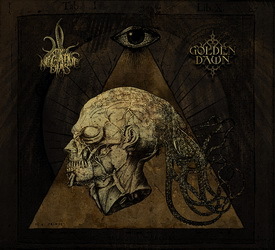 Coupled with the legendary Golden Dawn, active since 1992 and linked with bands such as Abigor, Pazuzu etc. is inspired by shamanism, lucid dreaming and personal experiences with astral travel. The music is a rich tapestry of creativity melding symphonic black metal and dungeon synth with dynamic and complex compositions which are bombastic and majestic whilst never forsaking their raw edge, or Black Metal roots. The culmination of the mutual collaboration is a special split release featuring two lengthy songs, ‘The Temple of Cruel Empathy’ by The Negative Bias and Golden Dawn’s previously unreleased, ‘Lunar Serpent’. Released in a special digipak edition & limited to only 500 copies.